Cloudy with A Chance of Meatballs filmmakers Phil Lord and Christopher Miller have successfully assembled this animated feature film around our collective goodwill towards the Lego brand of Danish construction toys. The Lego Movie is a surprisingly inventive, thoughtful action-packed adventure comedy about childlike imagination and the wonder of play. Its script is filled with hilarious jokes while being innovative in its narrative structure exploring the nature of toys. Lord and Miller mix conventional three dimensional CGI animation with Lego like artistry using stop-motion reminiscent effects fluidly mixing filmmaking techniques with genre storytelling. Everything in the film is designed to look and move as if were made out of actual Lego bricks and pieces. It's truly a great example of uncynical brand extension and synergy. On first thought, the idea of a full-length narrative story about fictional characters based on toy constructs (in their own world) seems foolish, but the way it's realized and incorporated into (sort of) live action adventure is sensational. Why we are watching Lego pieces walk around is explained quite satisfyingly without ever addressing it explicitly. Its entire construction features a pretty solid aesthetic all around, mesmerizing in its balance of technical and narrative storytelling. Most interestingly, the film explores themes of conformity. Initially, Lego toy kits generally came with many different pieces without instructions, allowing kids to build their own creations. Over the years with increasing popularity, Lego has shifted to licensed kits from outside fictional universes and other brands (many featured in this film) with strict instructions. All this is wrapped around a basic hero's journey very similar to The Matrix before turning on a supposition on child's play, imagination, wonder, and celebrating creativity. The cast and voice work is unsurprisingly great as there's a nice balance of diverse talent between Chris Pratt and Elizabeth Banks playing our heroes Emmet and Wildstyle while the likes of Liam Neeson, Will Arnett (as Batman), Morgan Freeman, Channing Tatum (as Superman), and Will Ferrell populate this imaginative Lego land of creations with cameos galore. Even with injecting a plethora of famous characters from DC Comics to Ninja Turtles, The Lego Movie explores its own mythology perfectly. "Master Builders" are those who create Lego creations from whatever pieces they see in transforming sequences reminiscent (but much more inspiring) of another toy-movie franchise, Transformers. This is contrasted with conventional building from set models with instructions. It's a charming look at the culture of architecture in Lego fandom with cinematic twists at every turn. The Lego Movie is full of contemporary feeling nostalgia with the way it mixes genres and fictional characters from different universes. It makes sense, coming from the mind of a typical Lego builder full of wonder and imagination. As a joyous piece of cinematic art itself, it's splendidly constructed and realized with a universal story of being special. 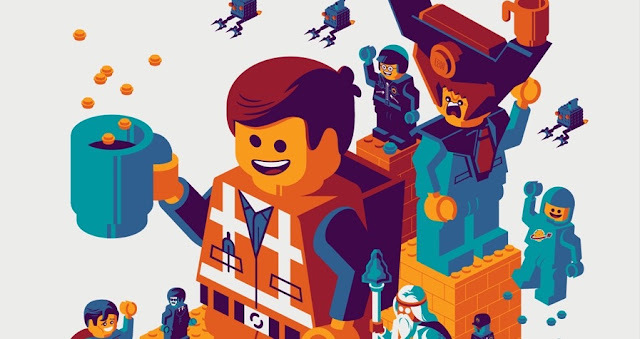 As a film, it succeeds both as popcorn child entertainment and an excellent interpretation of Lego toys representing building blocks of a greater whole. It bursts with optimistic energy. It's a movie about Legos and everything they represent at its core.